breakfast sandwich with bacon, caramelized onions, and fig jam. This breakfast sandwich probably doesn’t even “count” as a recipe, but the combination of flavors was so perfect, I had to share. 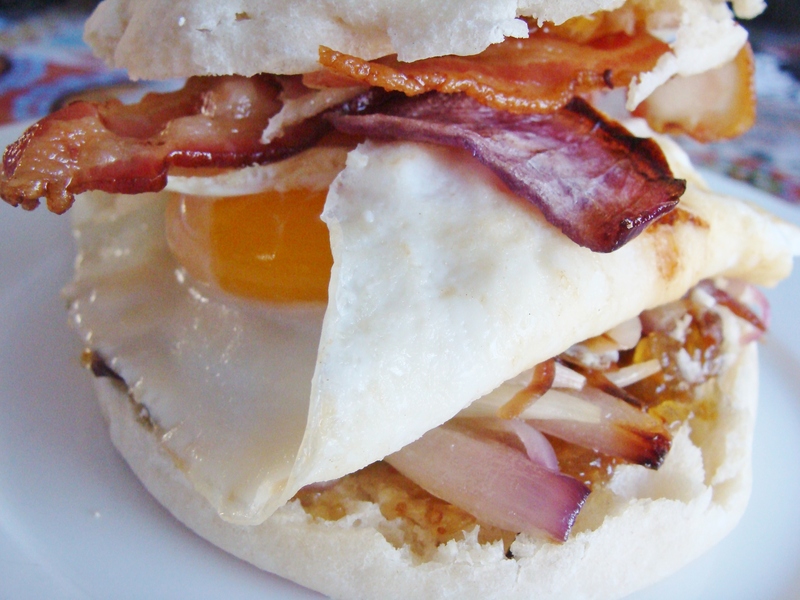 I love homemade breakfast sandwiches — no frozen or McDonald’s varieties for me. Usually, I stick with one fried egg and some cheddar cheese – maybe a link of turkey sausage. But on Saturday morning, I wanted something more indulgent. 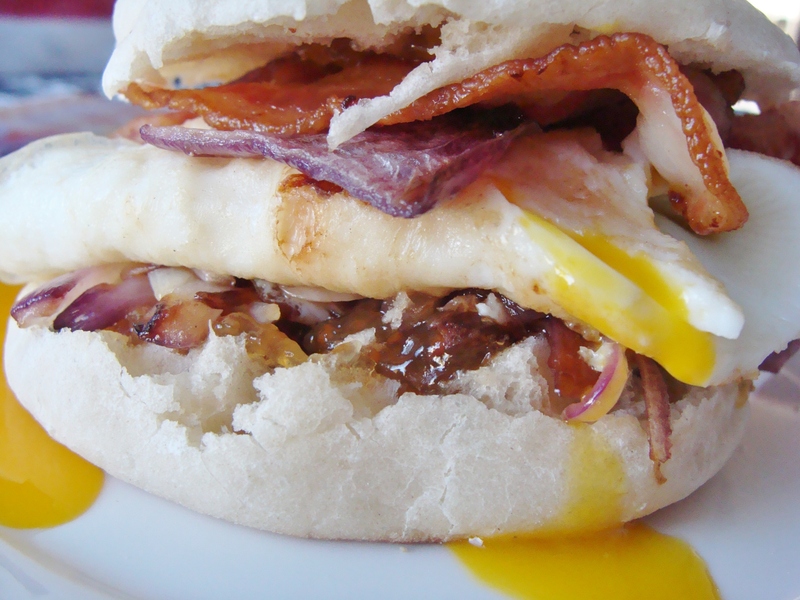 I woke up craving this sandwich: caramelized onions…freshly cooked bacon…fig jam…an egg over easy. Cook your bacon, using your preferred method–mine is on a flattop griddle. Put your English muffin in the toaster, and cook your egg as you like it. I like mine over easy, so I crack the egg in a skillet, add a tablespoon of water, and cover the skillet–letting the egg cook for about 2 minutes. Spread the fig jam on both sides of the English muffin. Add some caramelized onions, top with the egg, more onions, and your bacon. Cracking the yolk is my favorite part. Perfection! § 2 Responses to breakfast sandwich with bacon, caramelized onions, and fig jam. Thanks for the link, Bob! You are currently reading breakfast sandwich with bacon, caramelized onions, and fig jam. at The Cheesy Kitchen.